Start or interrupt your hop-on hop-off sightseeing tour of Berlin at stop Unter den Linden/Friedrichstraße. 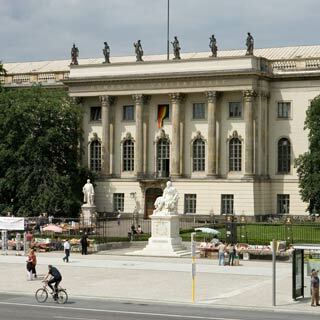 The magnificent boulevard Unter den Linden (Under the linden trees), located in the heart of the historic section of the city, is Berlin’s oldest boulevard and runs from the Brandenburg Gate to the castle bridge and the Berlin Cathedral. The Friedrichstraße runs as a straight north-south axis through Berlin. Between Checkpoint Charlie and Friedrichstraße station a completely new shopping area came into beeing when countless new buildings were erected after the fall of the Wall.